As you all know, Chris and I ventured around the Bay Area (aka primarily the San Francisco region) this past week. Our journey began on Tuesday, when we made our drive up north. Our first and only stop was at Santa Nella, CA – for In-N-Out and gas. We arrived at our Airbnb way past check-in but our hosts, Andrew and Lamort, were very accommodating (I mean, we already did pay sooo….). The Airbnb we booked was a bungalow detached from the main house in the city of Richmond. It honestly felt like living in the cabin in the middle of the woods – they had so much greenery in their backyard. We also met their backyard/outdoor cat, Tiger. They were still finishing work on the outside, but the inside was perfect – small but cozy. Wednesday was our first official day up north and that’s when the adventures began! 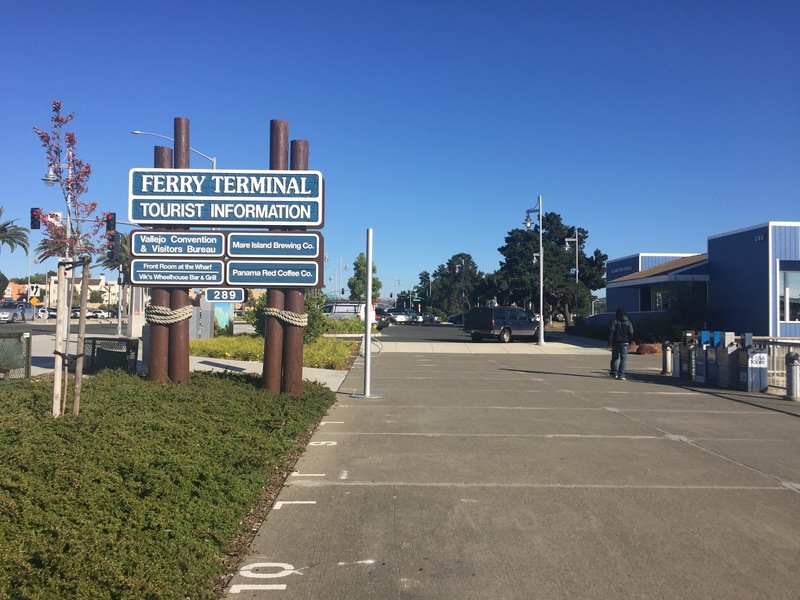 We drove up to Vallejo, CA to get to the Mare Island Terminal; unfortunately after waiting forever for the stoplight to turn green, we made a U-turn and just opted for the main terminal in Vallejo which was literally right down the street. Thankfully, we made it in time for the 9:30 ride. Upon arriving Pier 41, our first order of business was food! We walked into the first restaurant we stumbled upon which was the Franciscan Crab Restaurant. I got the crispy chicken sandwich and Chris got the shrimp & fries! Which we then got a side of garlic fries – mmmm. Afterwards, we watched Alcatraz from across the bay. We had planned on doing the tour but opted not to because it seemed rather pricey, maybe next time. Plus, we were tired after having been on the ferry for an hour or so. After strolling around for a bit, we decided to head over to the Golden Gate Bridge. Chris insisted on walking but I wasn’t up for it. We both downloaded Lyft, signed up and sent each other promo codes so we could get discounts on the ride. We requested a Lyft and headed to the bridge. It was about a 13-minute drive to get there. We did the little trail to view the bridge from the bottom. Chris and I were enjoying the view when we saw three whales in the water!! I had gone whale watching years before and found no luck. So to see the whales when I least expected them was such a lovely surprise. After enjoying the view of the bridge and stopping by the gift shop, Chris and I decided to head back to the city. We requested another Lyft and asked to be dropped off Mr. Holmes Bakeshop – mostly because I wanted to see this sign. We got their blueberry & thyme donut to go and walked to back to the Wharf. Note to self: walking around SF is a pain! Too many hills! We got a good workout though, so I guess that counts for something. When we got back to the Wharf, we finally found the hip and busy part of it. We were strolling and came across the SS Jeremiah O’Brien. The tour didn’t seem too interesting so we were content with getting photos from the outside. From here, we made the 20-minute walk to the Ferry Marketplace to catch the ferry back to Vallejo. We stopped by the brewery next to the ferry terminal. I got the regular grilled cheese while Chris got the pulled pork. After dinner, we headed back to our little airbnb and binge-watched some Criminal Minds. Your photos with the both of you are so cute! The outside of the Airbnb looks kind of sketchy but glad it was finished and perfect. Also love the strategic use of Lyft! Wait, do you guys have matching glasses?! Haha, so cute. I love the Fjallraven backpack too. I was thinking of buying one, but I don't know what color! 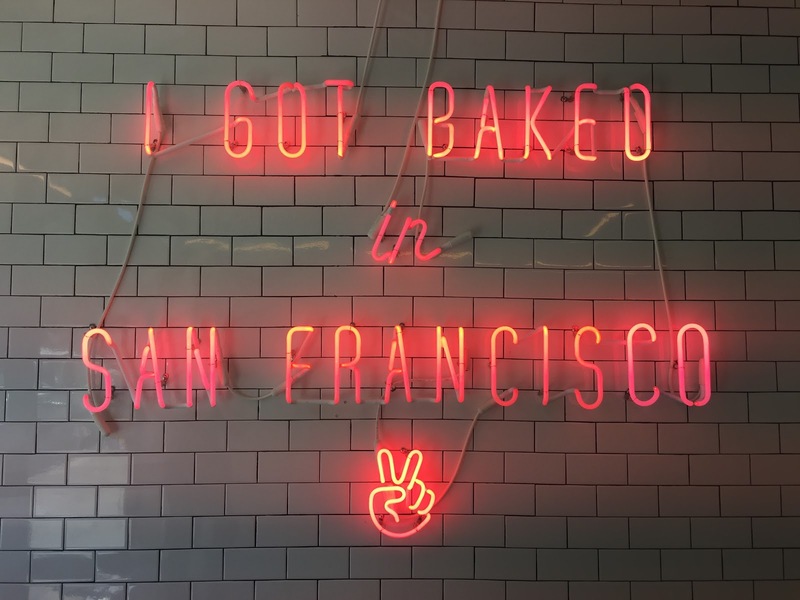 I love the "I got baked in San Francisco" sign and I've always imagined that SF was full of hills. Thanks Nat! It kinda did look sketchy; I definitely felt my heart dropped when I saw the outside! But like they say, never judge a book by its cover. The styles are similar! He uses Main+Central while I have RayBans (my dream brand of eyeglasses!). Get it! I love the Fjallraven Kanken – so glad I listened to my cousin and bought one for myself. I don't remember SF being full of hills to be honest…. It such a great trip! The Golden Gate Bridge is pretty impressive! I love these photos and hope you had fun! Looks like an awesome trip – I like the wharf area and they have amazing food! It's so cool how we were in the Bay area a week apart from each other! (Except you got to skip out on the crazy heat wave??) Pier 41 has awesome food!!! Mmmm I would love some shrimp and fries XD. You and Chris are smart with the Lyft promos. It's so cool that you got to see whales up there!!!! Haha, I would've preferred the clear view of the golden gate bridge ;). I've never gone for a cottage type of Airbnb before but it sounds comfy! Sounds like you had a great time going up there. I need to make my way back to the Wharf for some more delicious food someday! The place looks amazing! 🙂 Ahhh I hope I could fly there too! You're too kind – I try! The wharf definitely has a lot of good food. Sadly, most seem too expensive for our budget. I know, super crazy! We could've met up! Pier 41 has the most amazing food ever; I'm just bummed that the lobster rolls over there are way too pricey. We try to save money every little possible we can during our trips – that way we can use it for buying souvenirs instead! It looks really sketchy outside but the inside was very comfortable. It's a pretty nice place to see and visit. You should check it out sometime! How exciting! I'm kinda bummed because when we left, the weather was very foggy and that's the kinda weather I like. You definitely should check it out next time. I miss NorCal! The last time we were in San Francisco was in September 2015, but Roan and I went to Yosemite/Sequoia/Kings Canyon last November for Thanksgiving. My auntie lives in San Jose and plans to move to Austin soon, so we must plan a trip back there before she moves! Love SF! What awesome pictures!